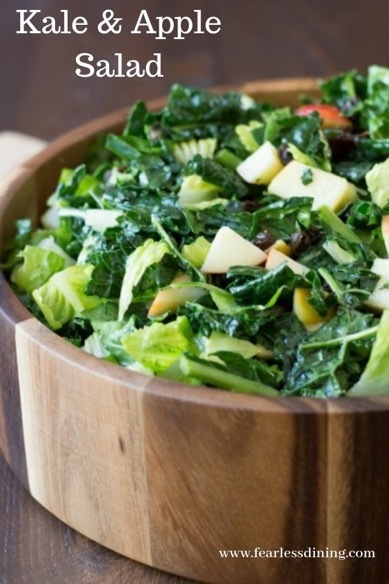 Kale Salad with Apples is a kid-friendly healthy salad recipe! 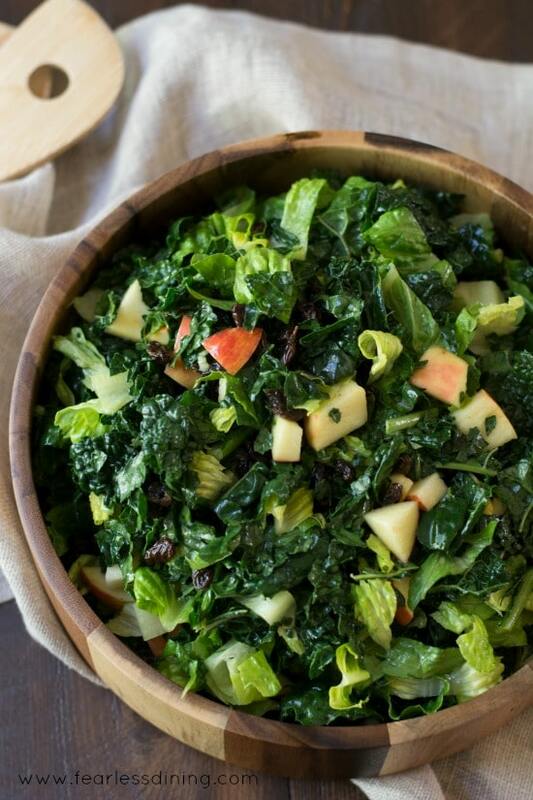 Crunchy sweet apples balance out the harsh flavor of the kale. 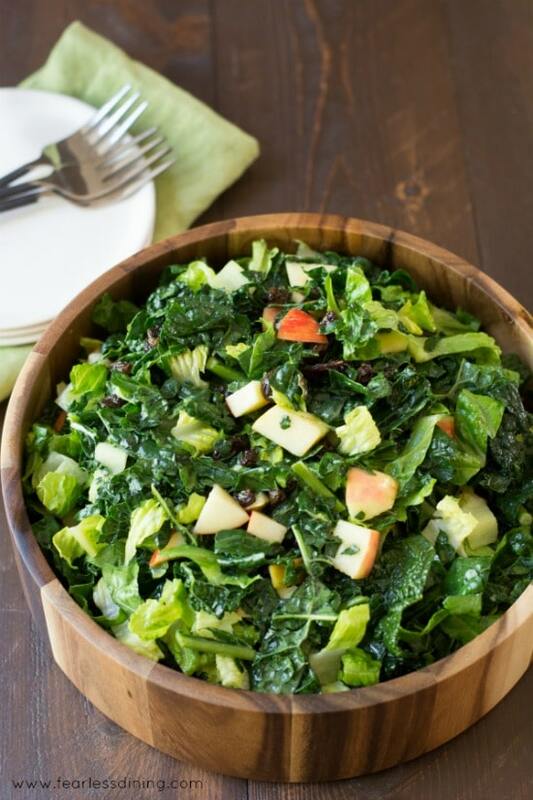 Tossed with a sweet vinaigrette, this Gluten Free Kale Salad with Apples is simply delicious! This is an amazing kale salad. This is the first kale salad that my family will eat. My kids went nuts over this salad, and they HATE kale!! I think it’s because the apples add a bit of sweetness to balance out the slight bitterness of the kale. 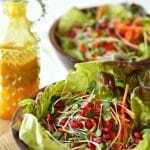 You can enjoy this salad as a side dish, or toss in some grilled shrimp or chicken for a delicious light meal. 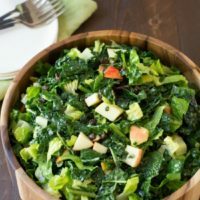 This easy kale salad recipe has romaine lettuce, kale, apples, and raisins…feel free to add other fruits, the dressing really works with the different flavors. I love how healthy kale is, but my kids HATE when I cook it. Using raw kale in recipes can be challenging, but there are MANY ways to use kale beyond a healthy salad. Toss a handful of kale into your favorite soup or stew recipe. In addition to finding a recipe to make with lactino kale (Tuscan kale), it helps if you know how to prepare kale properly. One tip I must share from Chef Lopez is to massage your kale. It softens the kale leaves and I know this sounds weird, but it reduces the bitterness a bit as well. Another great tip to making kale taste good is to make sure you remove the vein that goes down the middle of the leaves. This is where the bitter flavor comes from, so try to remove as much as you can. Mix up the dressing ingredients. Pour the dressing into the salad ingredients. 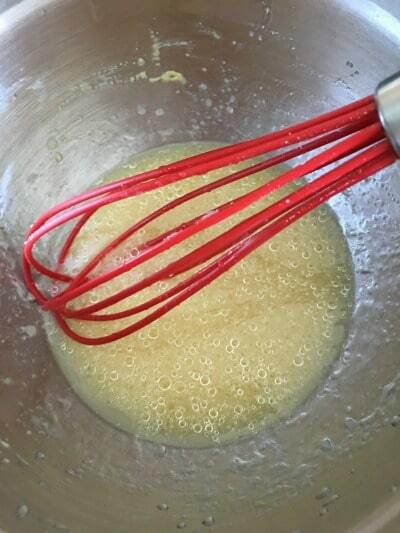 Mix and allow to sit for 10 minutes so the flavors can blend together. 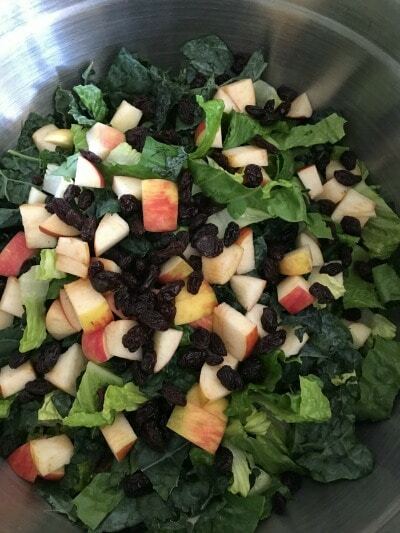 Kale Salad with Apples is a kid friendly healthy salad recipe! Crunchy sweet apples balance out the harsh flavor of the kale. 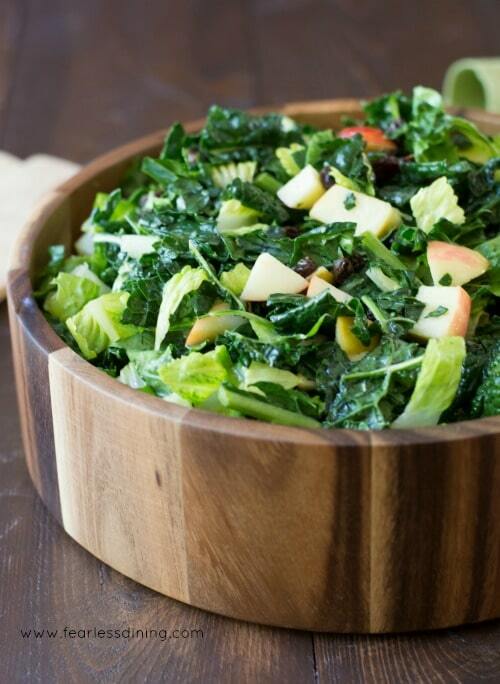 Tossed with a sweet vinaigrette, this Gluten Free Kale Salad with Apples is simply delicious! In a small bowl, mix lemon juice, avocado oil, vinegar, dijan, basil, and garlic. Whisk and allow to sit. In a large salad bowl, add all salad ingredients. Pour the dressing over the salad and toss to coat. Allow to sit for 10 minutes for flavors to blend. Fruit and kale go so well together. This salad looks great! Gorgeous kale salad! Thanks for all the great kale tips – I massage mine too! I love this combination! I use a lot of kale in smoothies and need more good salad ideas. Definitely have to try this one! I love all the greens in this salad! So healthy! So great for lunch! Yum! What a gorgeous salad!! YUM!! Love the combination of apple and kale. I’ll have to try massaging kale next time! Thanks for the tip! I thought massaging kale sounded silly, but it really works to make the kale sweeter. I love this salad! I love trying new and healthy salads! What a beautiful salad, and would be a great salad to bring us into the fall. This sounds delicious, Sandi! Thanks for sharing it at Savoring Saturdays!